»General»1. What is Web 2.0? In the past, only those who studied IT were able, using their skills with Web Design programs, to place information and ideas on the world wide web. Now, by using Web 2.0 tools, we have a read/write/share style of world wide web. Our students use these things intuitively – things like Facebook, MySpace, Flickr and YouTube. And many will spend lots of time interfacing with these applications because they enjoy this technology. The diagram above (from http://www.rossdawsonblog.com/weblog/archives/2007/05/) shows some of the many applications which now exist, some of which can be used to take advantage of this interest, and apply in educational settings. With blogs, wikis, RSS feeds and the many tools listed to the right, teachers can adopt and adapt technology to use the technological skills of their students, to motivate their participation and to model best practice when using these tools. Many of these tools also make life a little easier, once the basics of setting up or learning how to use them is complete. 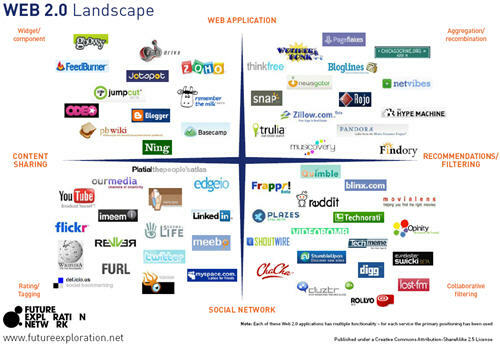 When one starts looking at web 2.0 tools it seems that there is always something new to learn about.